When I share layouts, insert designs and inspiration on Instagram (follow us @leatherquillshoppe) and on various facebook groups my number #1 is "where did you find....?" While I love shopping online and our local pen/stationary/craft stores I also frequent our local thrift and antique shops. When I say frequent I mean at least once a week. I love the thrill of finding really cool pieces, vintage goods, memorabilia to history I wish I could have experienced and I always get inspired when treasure hunting. I have many upcoming posts about using different things in your traveler notebooks, diy projects and more but I wanted to share the finds from my first treasure hunting adventure this month. Later on I will show how I am using the pieces. I do have some rules for myself when treasure hunting. When I find really cool stationary, ads, post cards, photos and such I research what it is, the date and so on. I make sure to do my due diligence to make sure I am not cutting, pasting and putting part of history in a notebook. If I find a piece was mass produced I have no problem adjusting it to fit my TN but if it is rare or I find it has a cool story and what not I will take a different course. For example the over 100 year old post card from Cloudcroft, NM did not get attached to anything. It is actually in a frame now but I did scan the image into my computer and printed it for art journaling purposes. Appreciating vintage objects is my goal, not destroying them. Ok! Let's see what I found! My first score is a vintage linen post card. The image is the Sandia Mountains here in Albuquerque. With the age of this post card I decided to scan the image and reprint it for journaling purposes vs using the original post card. I am pretty sure I paid a little much for this vintage Albuquerque Sunport post card but something you may not know about me, I love vintage planes. I appreciate the beauty of them. I just loved the blue sky, old airport and vintage plane. After doing some research I wasn't able to find much out about this post card so I did scan and reprint the image for my journal rather than using the original. The Albuquerque Sunport was built in 1939 so I am assuming this post card is from the 1940s. 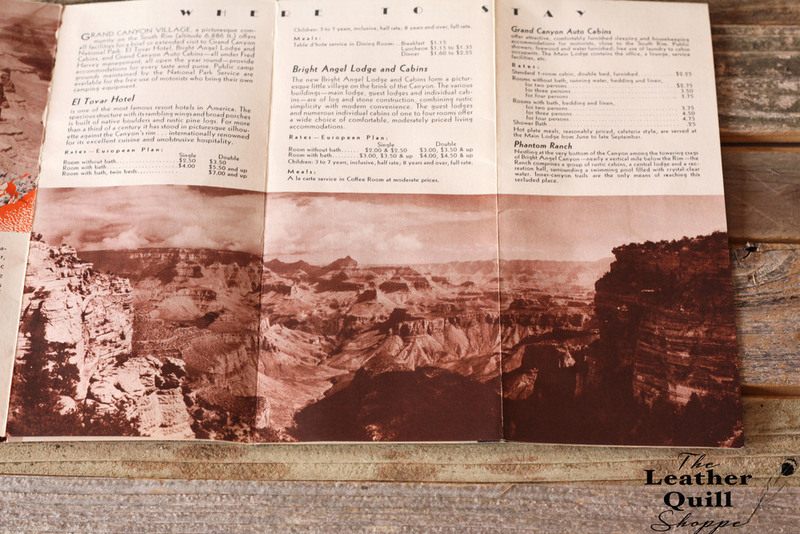 Vintage travel brochures are so cool!! This one is from the 1940s. I am trying to decide what I want to do with this baby. I did find a few on ebay so I am not as concerned about keeping it intact. The photos in this brochure inspire me! Look at these prices!! I am still trying to decide what to do with this gem but I was inspired to plan a mini road trip to Arizona! Post card from Cloudcroft, NM. 1908!! This card is over 100 years old! Cloudcroft is one of my favorite places to visit here. I love the small mountain town. The Cloudcroft Lodge is still around too! When I saw this card I knew it had to come home with me. I am going to have this card framed so I can display it in our Leather Quill workshop but I did scan and reproduce the image for some art journaling. This little card is one of my favorite finds ever! Yes Mrs. Lottie Cloudcroft is the grandest. Vintage Kopper Kard. These are still pretty popular but I haven't seen the End of the Trail design before. Kopper Kard is a cool company. The copper is embossed not engraved but it is mined from a local copper mine in Utah. I like to pick up old advertisements that inspire me. While I can't find out much info on the company I loved the old phone number! How neat is that!?!? I did a little research and I found out a local state rep is now using the space. Now for one of my favorite finds ever! I know, I said that about the Cloudcroft post card too but this was a good trip! I found this New Mexico Ghost Town Map from the 1960s! This baby is getting framed! I do plan on printing a few of the cool images for some road trip and adventure journaling. We now have a goal to visit some of these ghost towns this summer! I plan on keeping up with this series on the blog as a way to inspire and appreciate vintage goods. If you don't feel like digging around dusty antique and thrift stores you can always look for interesting items on etsy and ebay. Some of my favorite searches are "ephemera" "vintage (town, city, state)", "vintage ads" and more.